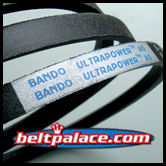 and PTO Belts > Dixie Chopper Lawn Mower Belts - High Quality OEM Replacement Belts > B92KC V-Belt for Ag, Farm, and Lawn & Garden Equipment use. 92" Length, 21/32" Wide. Kevlar Covered HD B92 Belt. 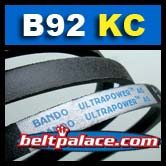 B92KC V-Belt for Ag, Farm, and Lawn & Garden Equipment use. 92" Length, 21/32" Wide. Ultrapower AG Clutching Cover (Kevlar Covered) High Performance B92 Belt. Specially suited for extra heavy clutching applications like Ag-Farm Equipment and Commercial Riding Lawn Mowers (Dixie Chopper/Hustler/Yard Man).